Comments There is something special about warm colors – something very rich, liberating and bearing a notion of strength. It carries the sense of assurance, of being there when strength is needed the most. Featured today is a natural hessonite of 2.96 carats from Sri Lanka. 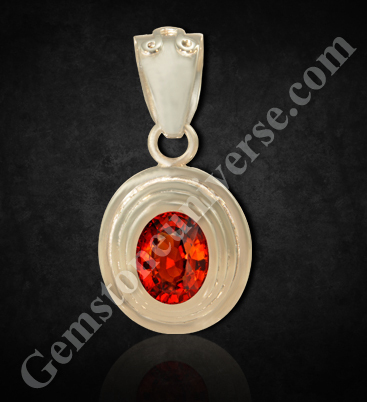 This oval shaped treatment free hessonite garnet is an appealing deep burnt orangish cinnamon color and has been set into a planetary bhasma Rahu talisman in sterling silver. 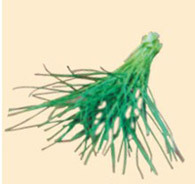 Please take note that the sacred herbal ash / bhasma of doorva also known as Bermuda grass has been sealed into the tubular channel and has been incorporated beautifully into the design element of the Rahu pendant. Also notice that the pendant bail has the symbol of Rahu in relief on it. Hessonite also known as gomeda/ gomedh/ gomedhaka is the gemstone for Rahu. In Vedic astrology, Rahu or the North Node of the Moon is a karmic planet and its planetary period / peculiar placement in birth chart can bring many challenges for an individual. It is symbolically represented by the head of the serpent in Hindu mythology. 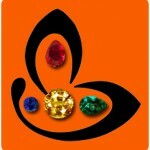 Hessonite is also known as the cinnamon stone by virtue of its color. Note: Thank You Dear Patron, for you gracious testimonial.